But anyway we visited it. It took a long while to get there as half the roads were closed off, and then when we did we had to go through so many checkpoints to make sure we didn't have any cameras on us. 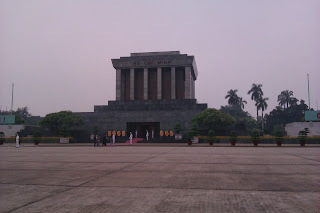 We eventually got into the granite mausoleum, and walked into the room, which had 8 armed guards in it, we did a quick walk past Ho Chi Minh and that was it. So interesting but I wont be visiting again! It was getting late by the time we got to the park. They explained to us that they had accommodation at the entrance of the park, which we would be staying in that night, and then the next day we could cycle 20 km up hill into the centre of the park and stay in that accommodation for the next night! We decided to go on a short walk around the botanic garden as it was going to get dark soon. This comprised of an over grown forest, which got increasingly dark with the beginning of night fall. We managed to get out of the "Botanic Garden" and were greeted with a display of fire flies. It was amazing, this beautiful experience was then hindered somewhat by then being barked and slightly chased by 2 dogs, which is terrifying when your in the middle of nowhere and its pitch black. We then got to our accommodation for the night which was basic but fine, our toilet was outside and across a bridge, which was fine and you got to see alot of weird insects. 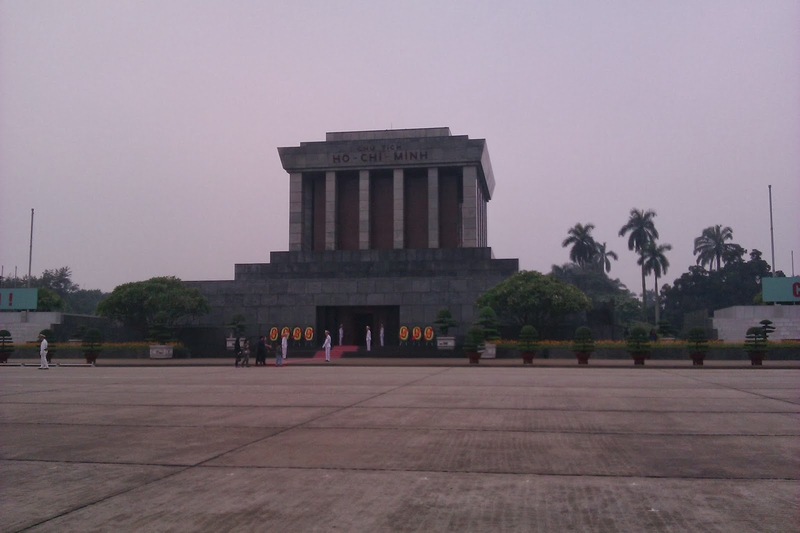 The Next day we woke up and took a trip around the 2 sanctuaries they have at Cuc Phuong. The first one was a turtle sanctuary, where most of the turtles had been saved from being made into soup (there is a big illegal trade with China for it), some of the turtles are very endangered. There was one little guy we loved, he was just so active. The second sanctuary was the Primate and monkey sanctuary, which contained so many types of monkeys I had never seen heard or seen before. Some were very beautiful. Most of them had been injured some way or trapped by hunters and then saved. They then keep them in the sanctuary until there stronger, then they are released into a caged off part of the forest until they can survive by themselves (apparently at the beginning they all come back to the fence to wait for food), it was really amazing to see these very endangered primates. Most of them only live in Vietnam and the surrounding areas, so we were really lucky to see them. We then hired our bikes, we then cycled towards and around a lake. After we had been going a few km Andy felt sure we were going the wrong way, as the road didn't seem to be going uphill much, and we had been told it was uphill the whole way. We then cycled back to the start to find out it was the right way!!! So we had to start the whole thing again, but it was much better to check than to find out several hours later that we had been going the wrong way. It was actually really fun, we stopped for a walk in the cave of the prehistoric man, which people had built a little shrine in, as it was where human remains had been found. To get to it, you had to go along these bridges which I almost managed to cycle off of! By the time we got to our accommodation we were exhausted, I couldn't barely ride anymore. There was a little cafe a few km from where we were staying, so we went there to eat, then back to our place. The place we were staying was super creepy. There was alot of little holiday apartments dotted around and yet we were the only ones there, in the place we were in, outside our room was a fully laid table set for high tea, with "I Love You" written on the wall in white paint. Once we started getting our room ready to sleep in we noticed there was alot of blood everywhere. It was dotted all over our mosquito nets, and there was a large dried patch on the floor! This was made somewhat more terrifying as the electricity in the center of the forest is only on from 6.30 - 9.30pm, so at 9.30 the lights went off leaving us in pitch black. We were scared in case there was a murder on the loose, but we survived the night!!! The next morning we headed off for our 20km bike ride DOWNHILL!!! It was really exciting, we were going extremely fast, we got into the center uphill in 4hrs but back it only took us 1.5hrs, and that was with the onset of a monsoon, we hid in an abandoned shack for awhile and the realized it wasn't stopping. The park staff were very kind and let us shower when we got back. We then caught a little local mini van back to Hanoi. Those last accommodations do sound creepy! It looks like a gorgeous bike ride though.